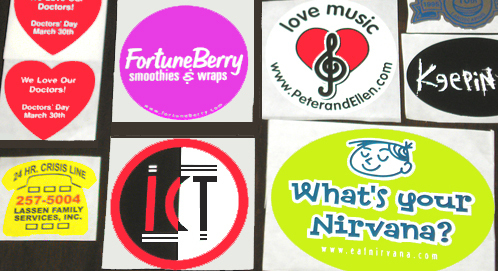 The Options for Customized Stickers are Unlimited! 1) For a cause oriented service group, a non-profit organization or company, custom printed stickers help provide safety, security and awareness (e.g. breast cancer cause, animal rights cause, anti-violence cause, anti-crime cause, among many others). 2) In a political campaign, custom printed stickers are used to endorse certain candidates who people should be voting into office. 5) For individual or personal use such as a party giveaway, an amusing gag gift or just for comic purposes.